For many years now fans of Bethesda’s open world RPGs have asked for a game that would allow them to explore one of these worlds with their friends. Earlier this year Bethesda revealed that Fallout 76 would allow them to do just that but there is a saying that you should be careful what you wish for. 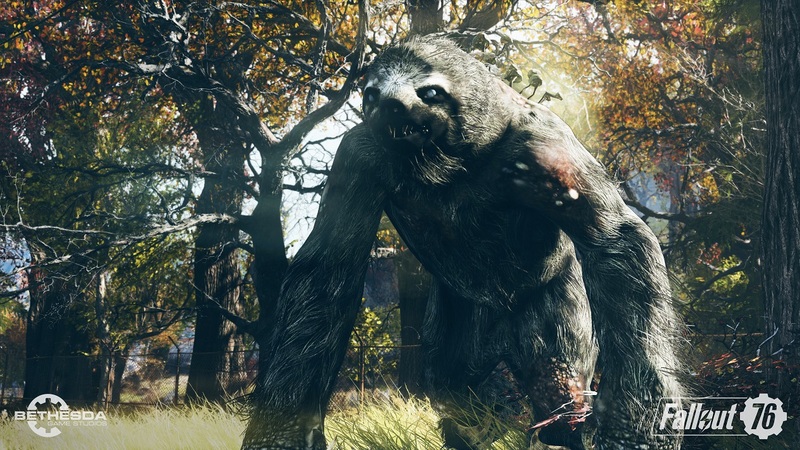 With odd design decisions leading to worry before launch, has Fallout 76 managed to pull itself together and deliver something unique or does it simply fall apart? After facing down seemingly everything that Appalachia has to offer, let’s find out. 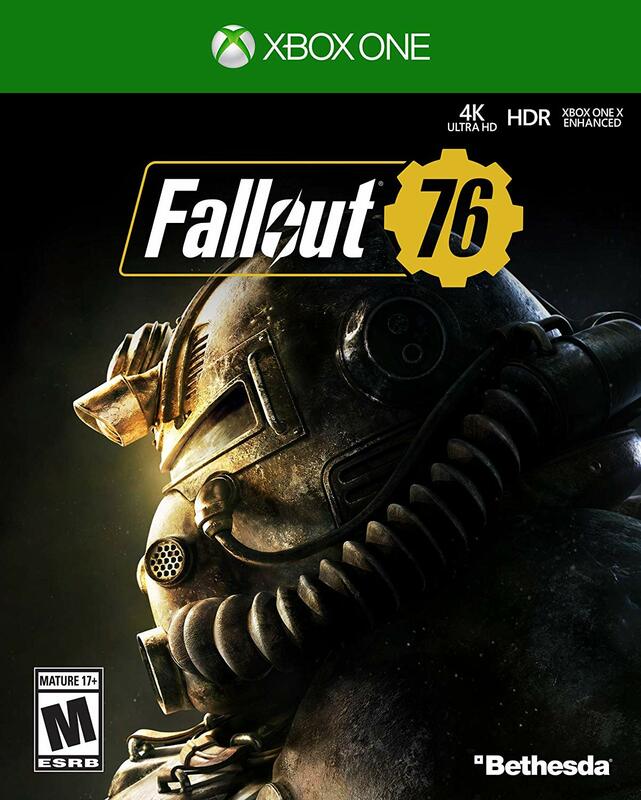 In many ways Fallout 76 starts out in a fairly similar fashion to other entries in the series as players wake up as the last resident of Vault 76 on “Reclamation Day,” a self imposed holiday that sees the vault door opening and sending its residents out into the world in an effort to rebuild the world twenty five years after the nuclear apocalypse. After customizing the look of your chosen character (which can be adjusted at any point in the game) players are given a fairly simple intro to the world through a handful of Mr. Handys and signposts left around the vault hallways as you make your way out of the area. In fact the only real path comes in the form of a message left by the Overseer who left the vault a bit earlier than everyone else as a scout of sorts. Once you actually leave the vault forever, since it is no longer accessible once you leave, there is really no direct objective pointing the players where they should go or what they should do. This sets up the main difference in Fallout 76 that finds players in the land of Appalachia with only a vague mission of following the Overseers journey and listening to the holotapes that she has left behind as a sort of guide. 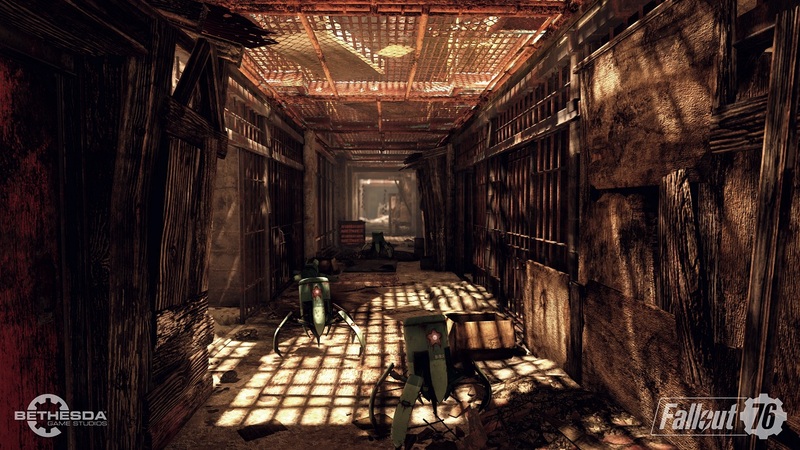 These holotape locations tend to fall into a partially recommended path that players can follow in an attempt to learn more about how to use the C.A.M.P. 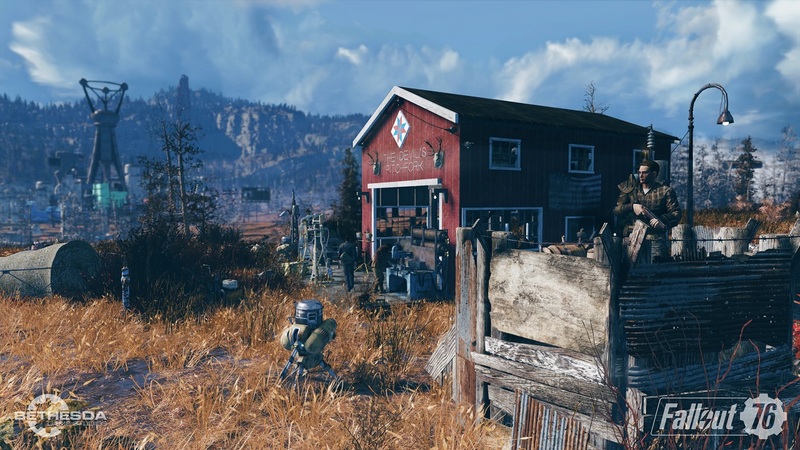 system and learning useful blueprints for it while also leading them to other more story based quests involving the new Scorched enemy types and mutations that have been found throughout Appalachia. 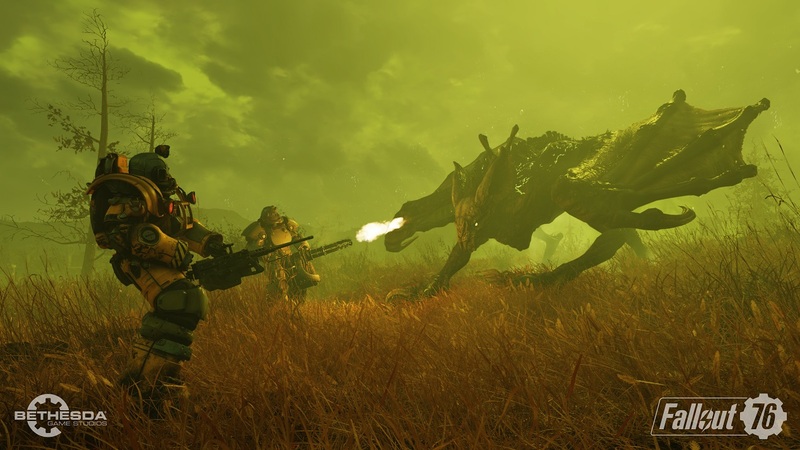 This idea of giving players the chance to have a truly open ended style of exploration may seem appealing at first but this unfortunately fades rather quickly primarily thanks to the design choice of making sure that outside of some robots and a certain friendly super mutant, the only other living beings that won’t attack you on sight happen to be other players. This means that while it may be enjoyable to explore the huge amount of ruined pieces of civilization, larger buildings, monuments to history, city-scapes, and even cave structures as well as mining areas, you will never really find a complete story to most of these areas. There are a large number of unique pieces of storyline that come from many of these areas that are revealed in the form of notes (that often desperately need a text pop-out function to be legible) or holotapes and occasionally a quest that will see you tracking down various things. The problem is, with every other human being and non-hostile ghoul dead, there is no happy ending or most of the time even an ending to these stories other than the fact that everyone died somehow. This vague style of storytelling only holds its shine for so long before it begins to lose its luster. It also doesn’t help the fact that while a number of areas may have at least some visual element to give players a hint as to what happened there, there are a large number of areas that are simply devoid of explanation or even a single note about the past making the enjoyment of exploration drop incredibly. This also doesn’t help when you consider how buggy certain aspects of the game can be when it comes to quests in a multiplayer world such as this. Since many tasks tend to rely on players following objectives that boil down to finding a thing or slaying an enemy in a certain location, there is a real issue with spawns in this game. Multiple quests have resulted in having to log out of a world (game session) and join a different one in the hopes that no one in this world has happened to explore that area yet or killed the creature tied to the quest. Or flat out having to restart the game because your main and side quests failed to load in properly and leave you with only daily missions listed. Combine this with the fact that there is basically no roleplaying element to this game as player choice boils down to ignoring quests or completing them as written, and you have many questlines that feel like they simply go nowhere worthwhile other than providing a small sampling of reward and, if you’re lucky, a bit of story. It used to be that finding a new location would be a sign that a plethora of new interactions would await the player with potential new NPCs and quests to undertake but that has almost entirely been stripped away here. That being said, as mentioned before, the Overseer’s journey does lead players into more information about the world and eventually into the more “end-game” style of gameplay and storyline that reveals a larger secret about the Appalachian region and the robots that inhabit it but don’t expect anything to really come from these missions once they are completed other than the ability to access the nuclear missile silos and perhaps trigger some of the bigger boss battles all while the Overseer vaguely keeps herself off-screen but knowledgeable about what you may be doing. This leaves players with brief shining moments of story that give them hints about the lives of survivors and how the world tried to stay together after the bombs fell but these moments are far too short to hold their shine long. Whenever a player joins a world in Fallout 76 they will find themselves joining an open world with roughly twenty or so players and once you set foot outside the vault the game opens itself up to you almost immediately with every option available outside of PVP which is locked behind reaching level 5. Exploration and combat work in the same exact fashion as Fallout 4 with players being able to run using AP (Action Points), jump, shoot weaponry, swing melee weapons, and simply gather everything in sight like a hoarder before running the risk of over encumbering yourself. Even fast travel is available when you find locations though using this system does cost Caps with the price increasing the further away you are from the destination It is worth noting that the V.A.T.S. system has been reworked a bit to work with the always online and moving nature of Fallout 76. Rather than freeze time V.A.T.S. now works more like a lock on system that allows the player to focus on a single enemy with their percentage to hit being displayed with every gunshot or attack using a certain amount of AP and it is also worth noting that until players unlock a specific perk V.A.T.S. will only target the general body and not allow for specific limbs to be targeted, but even then targeting specific limbs really never feels necessary outside of a specific flying enemy type that really only comes into play in the end-game. Speaking of perks, players still have SPECIAL stats to work with in the game with every level up rewarding the player with the chance to place one stat point into a specific SPECIAL stat. 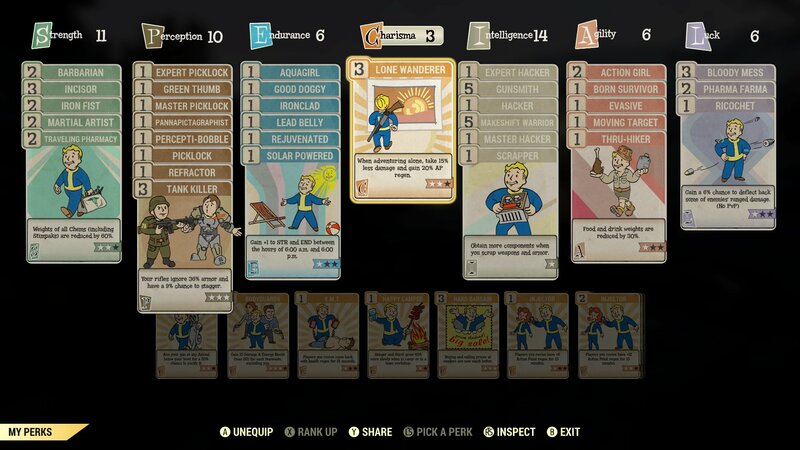 The unique way that Fallout 76 handles this system comes in the form of perk cards with players gaining access to higher ability perks as they level up. This means of course that you cannot access things such as level three lockpicking until you happen to reach level forty, but you will also need to be careful of how you select these cards. While players do unlock a randomized card pack every five levels, the main way you can choose to unlock a specific perk is by choosing it when you level up that specific SPECIAL stat. This means that you will actually need to keep an eye on how you are building your character as it is entirely possible to end up with a poorly balanced character if you happen to place points only depending on the perk cards you want to access. Each SPECIAL stat does cap out at 15 with players only gaining these points up until level 50, meaning that you can either choose to be the master of a couple stats or a jack-of-all trades if you so wish. After level 50 players will still unlock cards through standard level ups and card packs but they will no longer gain SPECIAL points. This is where balancing your perk cards comes into play as each SPECIAL point determines how many perks can be applied to that stat. It is worth noting that, despite certain pieces of equipment providing boosts to SPECIAL stats, they do not allow players to equip additional perk cards which is unfortunate. Having ten points in intelligence can allow for you to have perks such as level 5 gunsmithing, level two science, and then three single point perks though the good thing is that these perk cards can be changed at literally any time in the game. This means that should you not need to pick a level 3 lock, you can remove all of your lockpicking cards from perception and instead pop in a level three perk in its place, giving players the ability to actually keep their builds fairly fluid especially since so many perks provide different weapon types additional damage boosts or help out only in specific situations but prove incredibly useful when needed. 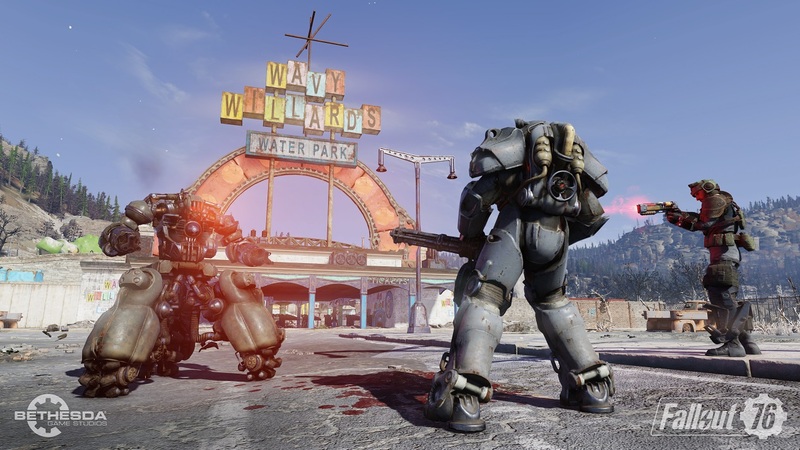 Because of this Fallout 76 actually does end up allowing for players to become incredibly strong in nature, though you’ll likely be wanting at least a few of the perks that lower the weight of some items due to the way other systems play out. As with any Bethesda RPG, taking everything that isn’t nailed down seems like second nature to a player but this will quickly begin to punish you in Fallout 76. Being over-encumbered slows you down and forces you to use AP to move and prevents fast traveling but there is only one other place to actually place things in the game outside of the robotic vendors who will buy your random loot at a pittance of what it is actually worth with their daily limit of caps, your stash box which has a paltry storage space of only four hundred pounds though Bethesda has stated that they are working to increase the space to an unspecified amount sometime in the future. Going out on an adventure and finding as much loot as possible from the world and from killing enemies is still an enjoyable gameplay loop but the fact that carrying junk to scrap, medicine to keep your health up, food and water to prevent yourself from starving or being dehydrated, ammo for weapons, and of course the weapons themselves means that you will be needing to limit yourself on how much you actually want to loot at times thanks to this issue. 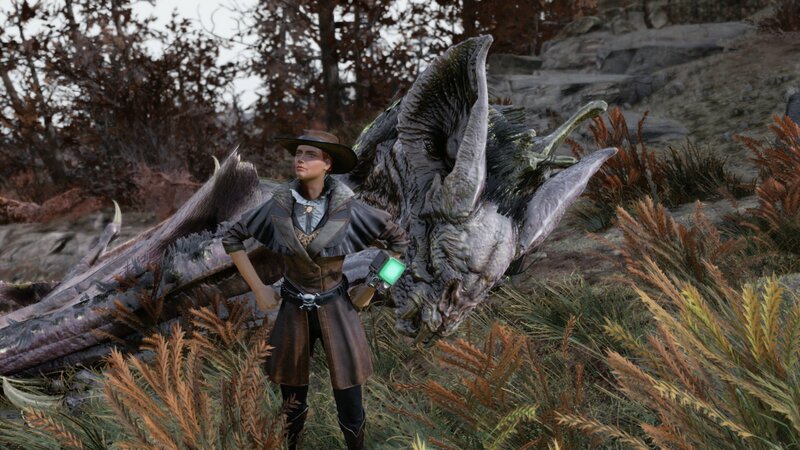 Finding special legendary gear from an enemy, or earning it from a unique quest, or a fancy weapon you like the look of used to mean at least storing it for later use or showing off in some form but now, between the junk needed for crafting and the previously mentioned elements, scrapping or flat out dropping some items ends up being the reality in Fallout 76‘s case. Reaching the limit of what you can hold is a huge drawback for exploration and while scrapping unneeded weapons and pieces of armor can unlock new mods for that type of gear sometimes, it rarely feels like it was worthwhile when all you’ve come back home to your C.A.M.P. with simply ends up as scrap that can be used to repair your damaged gear. The C.A.M.P. system itself is filled with potential as well as numerous bugs and flaws that often feel more punishing than not. C.A.M.P.s are areas that players choose to build a base for themselves and they can either function as incredibly simplistic forward bases that you choose to move around while progressing deeper into various areas or as steadfast structures that you’ve grown fond of and built and designed to your liking. Fast traveling to your base or the bases of people in your party or friends list is always free, making it a great way to travel across the map and access the necessary work benches to fix gear, craft ammo and meds, or drop off items in a stash box rather than finding workbenches and stash boxes in the wild. The problems come in the form of how unintuitive building structures in C.A.M.P.s happens to be as the game uses the same building set-up of the settlements in Fallout 4. Often objects will state that they are floating in mid-air or not being supported when they clearly are and even if you get it settled into place, you may even be told that no item is even selected. There also is a “C.A.M.P. budget” that limits how many things you can have at your home base and while it is very understandable from a server stability point to make sure that players cannot build mansions, the limit of what you can actually build is shocking at times. Moving a C.A.M.P. does cost the player caps unless you rather unfortunately happen to find yourself moving into a world where a player already has a C.A.M.P. placed down. In these instances Bethesda has made it so players will have the ability to move their C.A.M.P. for free but the problem here happens to be the fact that your building will either be saved in piecemeal blueprints that have to be setup again or in one gigantic blueprint that you’ll most likely never be able to properly place, meaning it will need to get broken down and built from the ground up. The bigger issue here also happens to be the fact that, unless you end up really lucky, at least a few of your structures will be lost in transition. This means any crops, power generators, water purifiers, defense turrets, and other things can often vanish with no refund in place meaning you will need to use occasionally precious resources to rebuild them once again. The fact that Bethesda has not allowed a check system to prevent players from losing their bases, provided the option to find another world with a clear location, or prioritized full blown bases with actual structures has left me and other team members more frustrated than anything else, especially when you visit your previous camp location to find a barren location or a simple stash box has replaced your elaborately designed structure. Though beware, taking out your frustration on their small object will net you a bounty. There is a system in place where players can choose to PVP one another if they so please though various adjustments have been made to try and balance the field unless you happen to have a bounty on your head. Other players can, generally, only do small chunks of damage to someone else until they are engaged by the other player. This is done in an attempt to prevent griefing but it still allows determined griefers to become a real nuisance at times, especially once you happen to reach a higher level as the game’s balancing features then begin to flip to the other side where high level players, such as those in the 60s, can almost instantly be killed by low level players in what is currently a glitched system that can be rather annoying. Thankfully all inter-player damage is negated when taking part in a public event so players can freely attack enemies without worrying about hitting random players that join midway. As far as end-game content goes, players generally are only really offered a few options at the moment and these really do require the player to be playing with a team of at least one other if not traveling around as a group of four to best enjoy the content. The end-game content comes in the form of tracking down nuclear launch codes and then infiltrating a silo to launch said nuke. These silos spawn an endless number of robotic enemies that are designed to thwart you at every step of the way as you progress to nuking an area of the map in what can become a true drain on resources if you aren’t careful. Once you’ve managed to actually launch a nuke the blast zone will generally spawn higher level foes that can drop unique items and change various pieces of fauna into rare crafting materials though the true end game comes from hitting a specific spot on the map and triggering a large scale boss battle that pits players against a dangerous flying foe that is far stronger than the other flying beast in the game. These encounters are rather exhilarating to take part in and playing with a party does help make the game shine at times but currently this being designed as the only real end-game style content, that can often drop some paltry rewards that feel like a waste of time, makes it feel a bit lacking once you’ve reached far beyond the soft level cap. 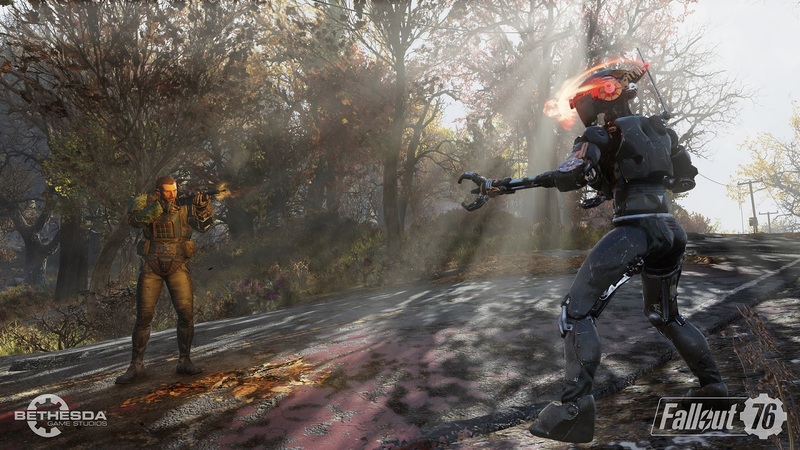 To make things worse, Fallout 76 remains as buggy and crash happy as it was during the initial B.E.T.A. versions of the game. Numerous times while playing the game we’ve found objects that would never load in properly, incredibly drastic drops in frame rate as well as freezes that make it seem like the game has crashed before snapping back into place after thirty seconds, quests that only trigger for some party members and not others, C.A.M.P.s glitching out in often spectacular fashion, and an incredibly high frequency of server disconnects that have seen my entire party forced back to the main menu far too many times to count. These disconnects then can run the gambit of losing quest progress or a side quest entirely making it have to go be reacquired to making a player lose their base because they loaded into a world where someone else had only a grill placed down and nothing else. Exploring the land of Appalachia will find players traveling through forested areas, burned out environments, mutated lands and much more in what may be the most varied map in the series’ history, only making it all the more disappointing that exploration is often not rewarded well enough because most locations do truly stand out from a visual perspective. There are even a number of unique foes only found in this game as well since there are creatures based off of myths mixed in with a large number of new mutated animals such as squirrels, beavers, and opossum, and of course all of the different foes that have been mainstays of the series so far. That being said, visual glitches do abound in this game with many of them being mentioned already such as objects not loading in properly or textures turning into static fuzz, random floating pieces of debris, and character models glitching out when exiting power armor. More than a few times the games collision detection has forced me to fast travel to an area or party member due to being trapped in the environment and enemies can even find themselves spawning below the ground or inside of walls, occasionally ruining specific quests that involve taking down all enemies in an area forcing either a restart or an abandonment of these pop-up events. One thing that Fallout 76 does tend to handle well is its soundtrack. Pulling from tracks found in Fallout 3 and 4 as well as a large number of new music listening to the standard radio has never sounded better while classical music is still an option if you are feeling fancy while slaying scorched and super mutants. It also feels like a bit of a missed opportunity at times that there are no living NPCs to interact with in this game because the holotapes you do find have some great sounding voice work accompanying them. 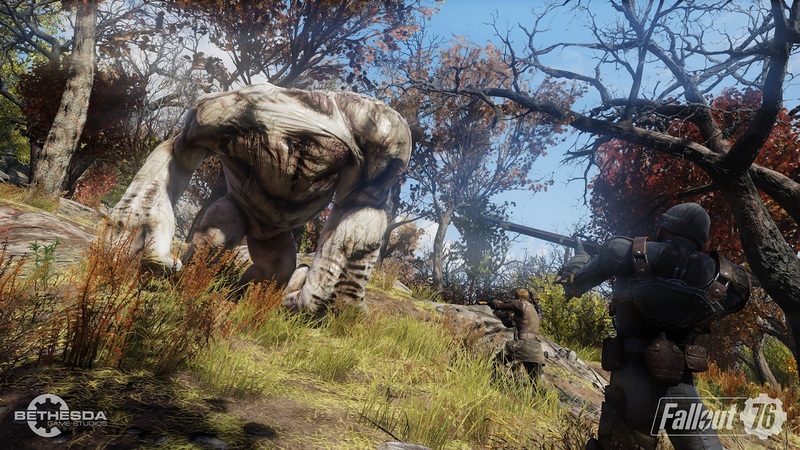 Fallout 76 often feels like it has the makings of being a great game that can be enjoyed both solo and as a member of a team as the world itself is thriving with new creatures to take down and so many places to explore. However poor design choices such as removing all NPCs and a core storyline without any actual payoff let alone sense of satisfaction puts a real damper on the experience. Put that together with an increasingly frustrating number of glitches and server crashes as well as limitations placed on the game’s storage and item spawning systems to try and get it to a stable pace and you have a game that you can still sink countless hours into exploring but only while suffering through an incredibly buggy experience that has so many flaws and missing story elements that even the best gameplay loops cannot overcome. 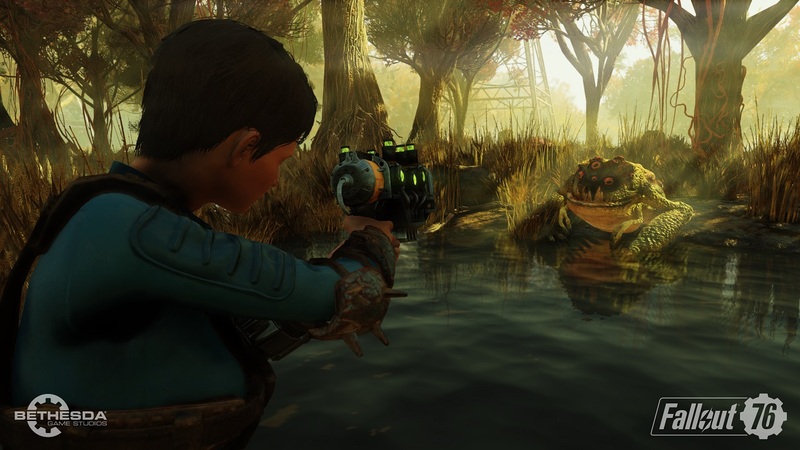 Fallout 76 can be a great time thanks to its satisfying combat, gameplay loop, and handling of perks but the removal of NPCs and therefore any real impact the player can have on the story, systems that are currently glitched or in need of rebalancing, and way too many bugs to count make your time in Appalachia one where the fun times can truly shine only to quickly fade the next time a glitch or annoying system rears its head.